One year ago today, I decided to take advantage of restaurant “freebies” that are offered to customers on their birthdays (I am becoming my mother-in-law.) My plan was to go to a Mexican restaurant to eat my free birthday burrito and then hop over to an ice cream establishment to get my free sundae…because I’m me and I love food. I was quite pleased with my grand idea and did not mind one bit that I was doing this on my own without anyone to share the experience with. Isn’t that what blogging is for? Some of you may remember that post detailing (TMI) how wrong the whole thing went. Let’s just say I never made it to my free dessert location due to the fact that the burrito grounded me stuck on a white shiny porcelain fixture at the closest Target Store. Lucky for me, I was able to enjoy many other scrumptious birthday meals once I recovered. 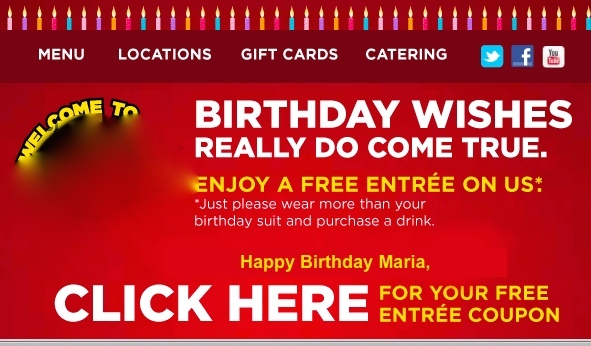 Although I am very tempted to give the freebies another chance (check out the personalized invite above), I think I will pass and just stick to stealing sugar packets from restaurants and consider those, my freebies. This year, due to my ailing stomach and aging intestines, I will most likely have a less than remarkable birthday meal/s. I have been cutting back on carbs and gluten, not necessarily by choice but out of an attempt to ease the increasing daily abdominal discomfort. It this what 52 looks like? Let’s see, the birth-day meal possibilities are…endless. It will most likely consist of a small bowl of cottage cheese with a handful of blueberries as my late breakfast, a round piece of cardboard (I guess they call them rice cakes?) with peanut butter and cucumber slices on top as my snack. A cheese stick (“I can’t wait to eat my cheese stick”, says no one ever) will be my second snack followed by a salad topped with home-grown acidic tomatoes (that hurt my stomach) from my garden, chicken or fish, more flavorless fresh cucumbers also from my garden, a handful of almonds with some type of blah dressing. I will then eat two whole bite size dark chocolates for dessert before I begin weeping. My point being that pretty much anything I eat these days causes me pain and bloating. I have reluctantly called my doctor to see if we can figure out what is going on THIS TIME. I am NOT at ALL bitter that my body keeps failing me, really – I am NOT! What would a year be like without some kind of illness or health challenge? I wouldn’t know. Thanks to my little sister (who just turned 50 – Thank GOD), the month of September promises to be a month of celebrations even if no good food is to be consumed by me. My crazy cousins and I are taking her for a girl’s weekend in a couple of weeks to celebrate her being almost as old as we are. WOOT! WOOT! It should be a weekend filled with lot’s of laughter, happy tears, incontinence (we are old) and lot’s of celebratory liquid gold! I will sacrifice my abdominal discomfort to make sure my sister has a great time and is as drunk as a sailor! Did I mention she finally turned 50? As if that wasn’t exciting enough, our dear mother surprised my sister and I for our birthdays, with a trip to Monterey, CA where she lives for half of the year. We are leaving mid September for 12 fabulous days of complete bliss! See how happy I am that she turned 50? We are two years apart and our birthdays are one day apart so by default, I get to tag along and get spoiled for HER 50th celebration. So, 52, I guess it’s a little nice to meet you. Another post I can totally relate to. I’m dealing with some issues now and it does get tough to keep the upper lip stiff. Aging is a drag. I know, I’m 54. Husband is 64, and has more health problems than I do. It doesn’t make the future look too golden from here. Still a celebration is in order! If you can’t really enjoy aging, at least enjoy the trip! You will love Monterey. I’m so sorry! Very shocking news for you I’m sure. I send thoughts of love and peace to his friends and family. Have so much fun on the weekend celebrating your old lady sister’s 50th. May you all leak a little from too much vino!! And, oh my Monterey present from your mom!! The best of the best come mid-month!! Yes, you are one lucky Mrs. B. Now. Let’s get these pipes working correctly, doctors, pretty please? Gracias, Mr. B. It’s never too late for bday wishes! I love to stretch out the celebrations as much as possible. The good news is that my stomach issues have improved significantly – since I stopped eating gluten. I may be one of those late gluten intolerant people. 😦 I love gluten!!! But, I prefer not to hurt and not to look super pregnant if I don’t have to. Orleans! Let there be music and drink and fine gluten-free food. Lobster has no wheat chaff, right? I am more than a tad envious, my dear friend. You are heading into a great stretch of happy-happy in improved health. Two words: Yee! and haw! Thanks so much for the wishes!! This weekend will be a fun fest with cousins! You know how that can be. 🙂 Next Wed I leave for CALI! I still can’t believe it! Where exactly are you, chica? My mother has a birthday just before Labor Day. My father wants to do a meetup on Monday. A DQ Blizzard cake. Hmm… so tempting. I had an easier time last month on my own b-day because Cimmy found box cake mixes that are sugar-free somehow. Not carb free, of course, but still. Speaking of tortillas and the like, Cimmy and I went to a Mex restaurant today that was “fast food” style- it used to be a burger joint. We got there late for lunch- but just in time for the 2PM 79 cent special on tacos. She sweettalked the staff when she saw them prepping tortillas, so they brought us some hot and freshly made. Then she told them her story of selling paletas back in the day, as she had a customer that would pay her in homemade tortillas. Happy Birthday and go for those freebies! I do. Why not? If someone wants to ge me a free meal I’m taking it! Happy birthday! Don’t worry, you’re just a baby. Things only get better from here on out. Take it from somebody who just turned 56. Did I say that out loud? Yipes. I won’t tell a soul! Another September baby! My birthday is the 9th (turning 51). Sorry to hear about the food issues. A food sensitivity blood test helped me identify foods that I’m very allergic (no anaphylactic shock, just really sick) to, and several that I’m just slightly allergic to. Have an awesome trip and a fun time celebrating! Happy Birthday. I am so tired of seeing doctors for all my ailments and I’m being a stubborn baby about going yet again, for more tests. I just want to eat and be happy! LOL. I missed last birthday’s post. I’ll have to look it up. Aging stinks but it also has its advantages. When I figure out what I think they are we can compare notes! And, as they say, it beats the alternative. I hope your birthday has been a lovely one. Last year’s birthday post made me pee my pants. Wishing you a very happy birthday! I’m still adjusting to 51- not ready to face 52 yet! Maybe by then I’ll figure out what these annoying pains in my elbows, knees and feet are! The happiest of birthdays, Maria! So glad you get a trip to California! Have a blast! Thank you, sweet Linda! I cannot wait to go to CA and celebrate. I am very close with my family and we can spend 24/7 together with minimal friction and stress. That’s rare! Happy Birthday, Honeybee. I hope you have a FABULOUS time away with your mum and your sister. And I hope that next year you will be able to indulge as much as you like. Thank you, Honeybee! I cannot wait to spend time with my crazy fun cousins next weekend and then my mom the following week. Just picture a bunch of brick houses dancing, eating, laughing and drinking 24/7. That would be us! I’m getting so excited for you and your upcoming trip. When exactly do you arrive in Murica? I arrive next Thursday – ONE WEEK – into NYC, where Samara will get me and keep me, and then I’m OFF on a whirlwind tour of people and places and I’m going to barely know which end is upwards, by the time it’s finished. BOOOOO 😦 *sigh* Come to England? Happy Birthday!!! Y que cumplas MUCHOS mas!! Sounds like suitable celebrations in the works. WOOT! And best of luck with the GI issues. Hope your figure out what to avoid and what you can still enjoy ~ then enjoy those things to the MAX. I am so looking forward to celebrating all month! I know it will be a blast to get together with my cousins, mother and sister. We are all a bunch of silly ladies who have to have fun at all times. 🙂 I’ll hopefully find delicious foods to indulge in. Happy birthday Maria! Hope you have a wonderful day and a fantastic trip. It’s always so nice to have something to look forward to and I do remember that story from last year. Take it easy girl! One bite at a time. No salad on your birthday! Happy Birthday! No one rocks 52 like you do, my friend. I’m sure you’ve had more unsolicited advice than you can stomach, so to speak, so why stop now, right? For what it’s worth, I had a considerable amount of gastrointestinal distress a few years back. I cut out gluten, almonds, and cow dairy, and I’ve been fine since then. I’m now convinced that cow dairy is as explosive as fertilizer. It’s not the lactose. It’s something about how it’s processed these days. Good luck! Have a wonderful birthday trip! I hope you will make some amazing memories. Thank your mother for me for having you. The world is a better place with your wit, your humor, and your smile. Happy birthday! Mine is this week. Sigh. I hear you when you say your body’s failing you. I think my foot’s broken (again), my knee gave out as I walked up the stairs last night and my back is on fire, so I’m eating Advil like M&Ms. But I’m still alive so there’s that. heehee. Enjoy your upcoming trip, sounds like so much fun!